Edited by Czarlson at 12:17, 06 Feb 2019. Someone find RPG and send this guy to Moon, then he can say "this is not planet Earth"
Edited by Czarlson at 11:55, 06 Feb 2019. Edited by blob2 at 12:42, 06 Feb 2019. With only scarce information about this new faction we can only "burn" our waiting time with pointless (or not) discussions and memes. Steampunk cowboys and incinerators huh. Not quite so high tech, though it feels a little out of place in heroes 3. Cove feels a lot more believable. Did you consider or are you gonna develop location based on Memory Mentor from H5? It works that the hero first chooses which skills to forget then he can choose new one or level-up one. After that he need to pay some gold and additionally all remaining points for the day are lost. I'm curious of that because this is quite interesting mechanics. I received a lot of times on my main hero two crap skills to choose in the same time. Truly speaking it would be enough for me to have possibility to forget/erase one skill without any replacement. Edited by fred79 at 14:17, 09 Feb 2019. 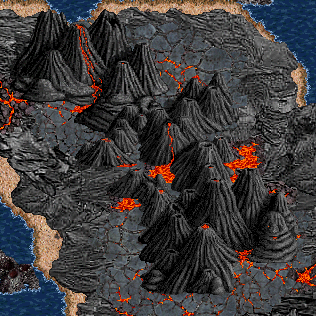 I don't suppose you guys ever considered making your own versions of the homm2 volcanic mountains, did you? Btw, docent, if you want my current work on ya'll's grass mountain concepts, let me know and i'll send them to you. Oh right, found it. Steampunk cowboys and incinerators huh. Not quite so high tech, though it feels a little out of place in heroes 3. Cove feels a lot more believable. I'd wait to see the whole picture, it's hard to get the overall feel with just a few glimpses. One thing that bothers me since the release of Hota: Why have the other factions not yet found out about gunpowder? Is there an explanation in Hota lore why only pirates have it (and soon the new faction as it seems)? Some infos from the source - interview with Docent Picolan. 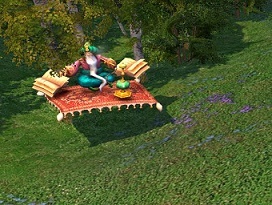 Gundpowder was always in HoMM series. Cannonbals in the Heroes 1 battlefield. Cannons from the clip of one of original Heroes3 campaigns. Do you have plans to add some new spells with the upcoming expansion? I would be glad to see this graphic in real game after 20 years. Edited by AncientDruids at 04:05, 09 Feb 2019. I can understand a nostalgia factor, but seriously? 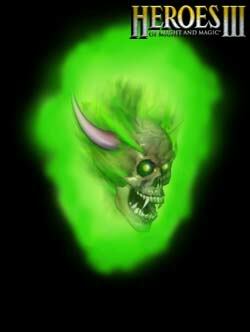 A green flying skull? Why should this be a recruitable unit? What would be its abilities? What would be its purpose and merits? Just a random neutral creature? I don't want to be mean. But I just can't imagine a good idea justifying such creature. Was'nt it some early concept creature of gorgon perhaps? I don't really see the point of a flowing green skull either. Lmao he's toking about new spells, not units. Some people seem not to read at all, aswell when I asked once for balance tips, but nearly everyone preferred to comment the screenshots. Nevertheless there is already a spell like that in the game's unused sprites. Looks kinda different, but it's also a skull in flying clouds. Edited by Macron1 at 10:40, 09 Feb 2019. This skull was meant to be added by 3DO into the same addon with Forge. Hota team shown screenshots with remake of this creature before. Edited by blob2 at 13:17, 09 Feb 2019. Well we have cthulu monsters already, why can't we have green flying skulls? Edited by DrSlash at 15:01, 09 Feb 2019. Edited by avatar at 16:09, 09 Feb 2019. Edited by Macron1 at 17:08, 09 Feb 2019. Edited by orzie at 17:23, 09 Feb 2019. It can be clearly seen that this is not Armageddon's Blade. By the look of the interface, it's clearly RoE alpha. They used (more probably, photoshopped on top of the image) MM6 icons and stuff. Verriker - this Demilich unit will be in vcmi's alternative creatures mod.